The Costa Brava is the most northern of Spain's Mediterranean coast and stretches from the border with France down to Blanes. Translated as the 'wild' coast the area is known for the beauty of its landscape, its sandy beaches and rocky inlets, and its great resorts. The region's inland villages, its proximity to Barcelona, and its variety of tourist centres all add to the appeal of Costa Brava holidays. Who Visits the Costa Brava? Whatever your age you can find a resort to suit. Families with young children have a wide choice of sandy beaches; eighteen to thirty groups have a similarly wide choice of lively resorts that party into the early hours; older couples can easily find a haven of relaxation. Cheap Costa Brava holidays cater for all. 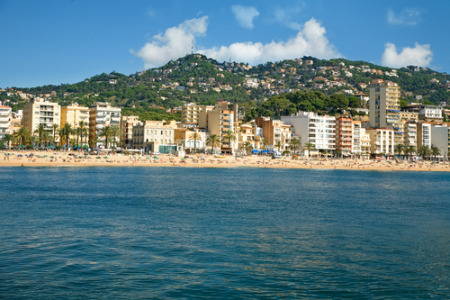 What is there to do on the Costa Brava? Away from the beaches, which are of course its main attraction, you'll find historic villages and towns, national parks, golf courses, hiking and cycle tracks into the hills and the forests. The Costa Brava has a range of tourist attractions, many of which are child-centred. You can find a water park said to be the largest in Europe, and a zoo. Most resorts also provide mini-golf. If you are looking for sand, Tossa de Mar would fit the bill along with Calella de la Costa and the Bay of Roses, as well as many more. Larger resorts generally have a good range of water sports and the rocky coves, with their clear blue water, are ideal for snorkelling and diving. Costa Brava holidays provide a range of accommodation offering comfort and good service, with tariffs that suit most budgets. Restaurants, bistros and cafes serve a wide variety of food with menus that cate for even the most conservative palates. In the larger resorts they cater for those who need their Sunday roast wherever they happen to be. If you are reluctant to order Spanish fare, try tapas and you'll be served a selection of tasty morsels which may then encourage you to be more adventurous. Local wines are very palatable and cost little. You can enjoy a Costa Brava holiday from early spring until late autumn with temperatures rising into the low thirties at the season's peak. Take a short flight from the UK and you could soon be enjoying settled weather where the sun will shine from dawn to dusk, the sands will glisten and the water sparkle. If you are looking for a cheap Costa Brava holiday you have come to the right site. As a price comparison site we can search for holidays from almost three dozen travel companies. With such competition, you can be sure of a bargain. Our easy to use search facility will lead you to the company offering a cheap Costa Brava holiday that is best value. Your trip to sunny shores is then only a phone call away.